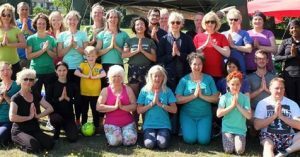 Once again we were blessed with warm sunshine for our second Iyengar Yogathon in Shrewsbury Park. 25 participants donated to Greenpeace to take part and were energised by performing 108 sequences of yoga poses in quick succession, each group of 9 sequences being led by different teachers. Half way through, the sun emerged as though it responded to our salutations. 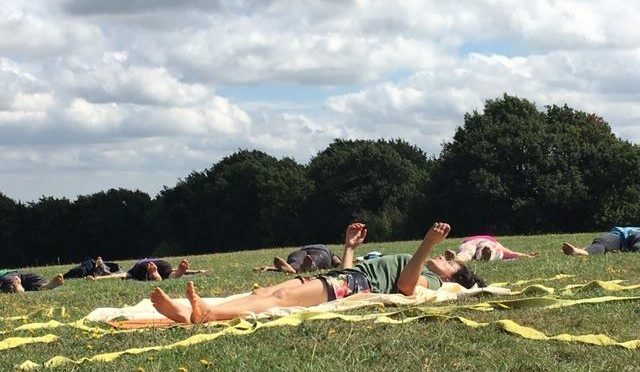 After our strenuous efforts we sat in the sun in beautiful Shrewsbury Park against the backdrop of the fabulous oak trees and the sounds of the gently waving leaves eating delicious Cuban food – most welcome. A representative from Greenpeace talked about what we can all do to limit our use of plastic, which is having such a deleterious effect on our planet. Many thanks to Kris Inglis, who liaises with Priscilla and the Council so that this event can take place. Thanks also to Ron and Paul for sorting out the gazebos. Well over £750 was raised for Greenpeace. What is the significance of 108? The number 108 is sacred and significant in many ways, appearing in many disciplines from astronomy to yoga: The number 108 appears in ancient, sacred texts. For example, there are 108 Upanishads and 108 Tantras, and Mala bead necklaces have 108 beads, which are used to count during meditation. In Ayurveda, there are 108 sacred points on the body. In numerology, 108 equals 9, which symbolizes universal love, eternity and awakening. In astronomy, the distance between the Sun and Earth is roughly 108 times the Sun’s diameter.